We have produced a lot of extension boards that can make your platform board more powerful, however not every extension board is compatible with all the platform board, here we use a table to illustrate how are those boards compatible with platform boards. Please note that "Not recommended" means that it might have chance to work with the platform board however requires extra work such as jump wires or rewriting the code. If you are interested in digging more, welcome to contact with techsupport@seeed.cc. 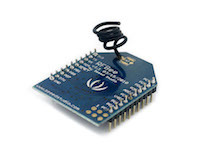 U2：CJT1117 IC, provides 3.3V voltage for XBee modules. U3：SN74LVC1G125 IC, achieves Logic-level translator function. 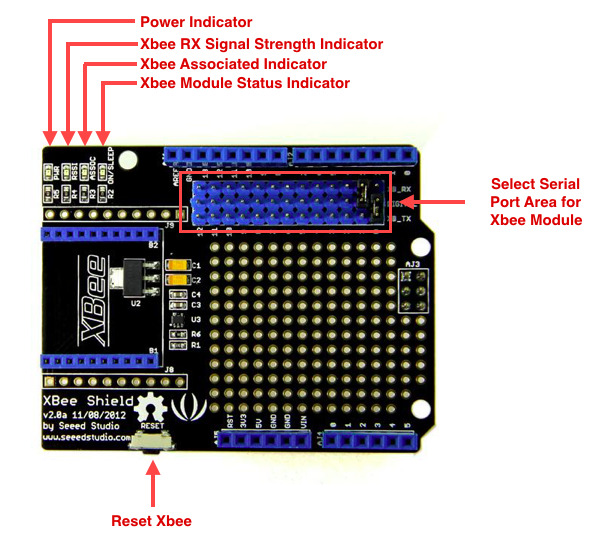 Here we will show you how this XBee Shield V2.0 works with RF Bee. 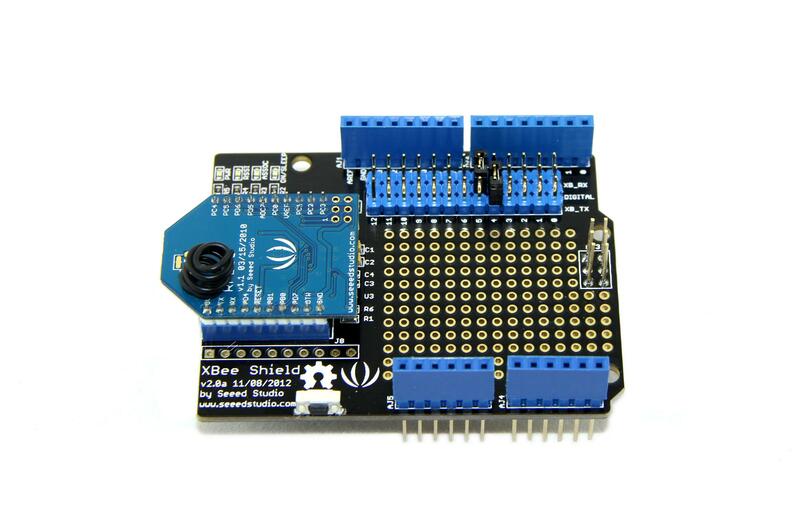 We also can use Bluetooth Bee or other modules. 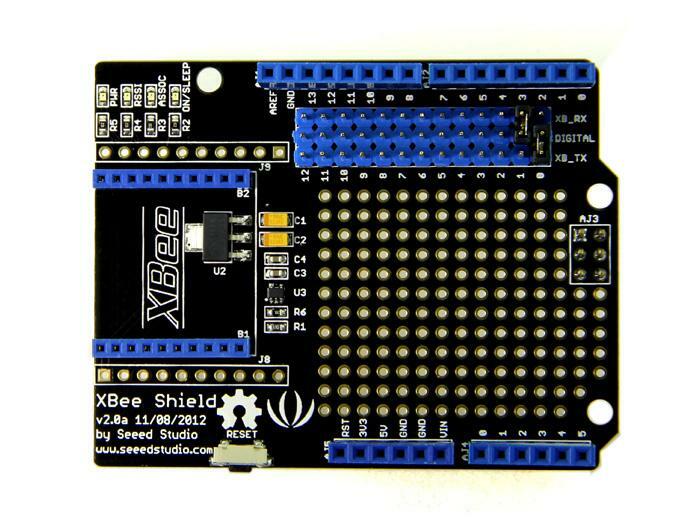 Plug RF Bee into Xbee Sheild V2.0. 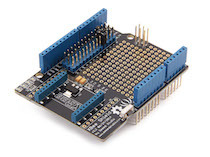 Use a jumper cap to connect XB_TX and Digital 4. Also, Use a jumper cap to connect XB_RX and Digital 5. Of course you can change the digital port as you like. But don’t forget to change the port number in the definition of the demo code at the same time. The followings are its known limitations: 1. If you are using multiple software serial ports, only one can receive data at a time. 2. Not all pins on the Mega and Mega 2560 support change interrupts, so only the following can be used for RX: 10, 11, 12, 13, 50, 51, 52, 53, 62, 63, 64, 65, 66, 67, 68, 69 3. Not all pins on the Leonardo support change interrupts, so only the following can be used for RX: 8, 9, 10, 11, 14 (MISO), 15 (SCK), 16 (MOSI). If you need further information about how to communicate, please refer to WIKI pages of relevant modules.